Free proof on custom orders - Call today!! 1 hour Free art design on all custom orders! create a truly thoughtful gift. Free proof on custom orders - Call today! As any entrepreneur knows, getting a business off the ground is a very difficult task. Equally difficult is making a company not only survive, but thrive and adapt to the ever-changing market to stay in business 5, 10, 25, 50-plus years. This is an achievement worth celebrating! While you might dread your own personal birthday, the opposite holds true for businesses. Few get to enjoy the heavy milestones of even the most veteran of companies. One of our most frequent requests at Totally Chocolate is anniversary-related gifting because of the success that comes with this type of business announcement. Business owners and marketers alike want to share their achievement with the very people who made it possible…their valued customers and partners! Which Company anniversary gift should I choose? When thinking about a company anniversary gift, this is your chance to get personal and send something that makes a statement of who you are. This goal has to be in perfect balance, of course, with a gift people want and appreciate. This is where so many people struggle and totally miss the mark. When you type in “company anniversary gift” on a search engine, you get a large selection of glass trophies showing an announcement or a selection of fancy-looking pens. Now, for internal use like creating a one-of-a-kind gift for the owner of a company, the glass trophy might be a very well received gift to showcase their achievement. However, we all know if you send a glass trophy or a pen to your clients that is all about your company, perhaps what you will get is a polite high-five or call before that trophy ends up in the trash and the pen stops working after 4 signatures. The reason Totally Chocolate has endured a lot of success in this category is we can elevate the message you want to send with a gift people love receiving. This is a paramount goal for any anniversary gift, send something people actually want. The other benefit of a company anniversary gift is an excuse to stay top of mind and maybe even cross market something you offer. A well-designed gift doesn’t have to just say, “Thank you for your continued work with us.” A well-designed gift can simultaneously showcase your beautiful new office and an image of your new product or anything you wouldn’t mind showing in a way that garners attention. Make it personal! We can place the individual name of your recipients on the packaging and match it to a hand-written note you provide us. That makes a statement that you put serious effort into your gift to make it special, even if it didn’t take you more than an hour. It is our job to do the heavy lifting for your company. Show what your company is known for! Maybe that is some precision fitting gear cogs etched in chocolate, maybe the front of a freight truck to represent your 40 year old freight management company. Make it unique to you and only you. Your gift should embody who you are and what you do. Think about your recipient. Maybe you only like the acquired taste of 90% cocoa dark chocolate instead of the normal 63%, but your recipient is not you. Sometimes you have to acknowledge a truly well-received gift always takes the general recipient’s opinion even if that differs from yours. Trust additional resources. While your company might be your baby, talk to people about ideas they think would register well too. At Totally Chocolate, with 29 years of experience and over 65,000 customers, we have seen it all and are happy to draft ideas for you at no cost. This is something we are proud to help with, having a lot of experience assisting with design ideas in every industry. Diversification. Think about ways in which your gift can possibly serve alternative goals like encouraging your valued recipients to follow your newly created social media pages. If they have supported you this far, they probably enjoy learning more about your company and don’t mind the nudge. Cost. Know your budget but don’t let it hamper your potential. The size of the idea is far more important than the size of the budget. 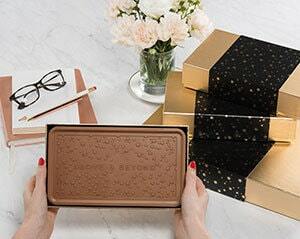 Creating an impression is all about design, not volume, when it comes to a great business gift. This is the best of both worlds: our 11lb Combo utilizing both Dark and Milk Chocolate in one product. Priced at $55 depending on your preferences, the 2lb Combo bar is in fact 2 full pounds of our Belgian Chocolate with custom packaging. At 14 by 9 inches, this piece is something people literally gasp at. We have witnessed several shocked faces in disbelief and it still brings smiles to our faces every time. Brandon’s recommendation: We have the ability to mold the center piece in almost any shape from a clean rectangle all the way to the outline of a wrench or golf club. Utilize this capability and make the center piece a strong focus of your brand name or product. Use the existing space surrounding the center with something unique like the signatures of your staff if you have a smaller company, other brands under your corporate umbrella, unique attributes that play off the center piece. Utilizing a unique packaging form that acts like an “envelope”, our Trio Envelope is one awesome piece for the marketing minded at sub $20. Priced at $19-16, the Deluxe Trio Wallet has (yes we counted) 394sq. inches of real estate to tell your story with all the room you could want. 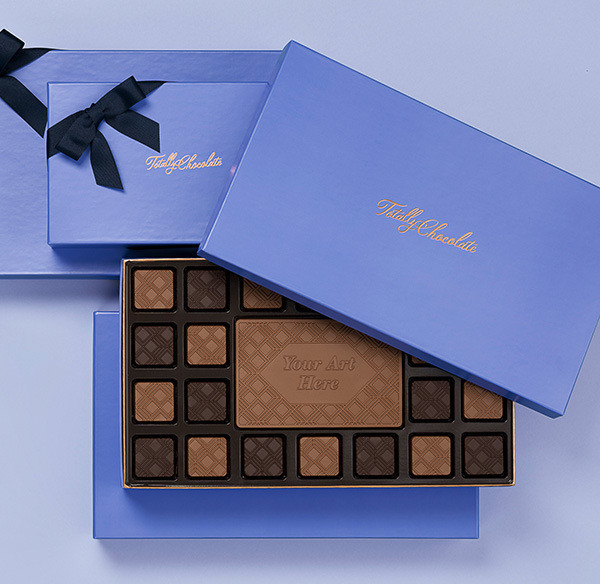 Inside are 3 boxes that each contain 3 gold foiled and branded chocolate rectangles, so a combined 9 pieces of chocolate (close to a half a pound in all). Brandon’s recommendation: Tell your story and make it follow theme. Use vibrant colors or patterns to stand out. With plenty of room for imagery, you can adequately show things of importance. As an example of a company turning 50: on one side you might have the very original photos of the first office, company vehicle and 2-person staff. On the reverse side you might have photos showing the current day office with a 100-person staff photo and the 40+ vehicle fleet. We can add even more detail like creating an actual vertical timeline showing the significant milestones in the company’s 50 years with personal messages from the current or previous CEOs all in one piece. The options are endless. The photo below depicts a winery that wanted to proudly showcase their top 3 releases available while celebrating their 10th year in business. 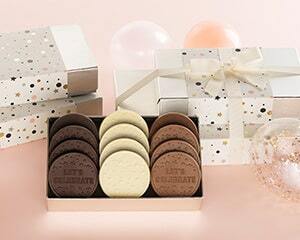 A new product from the Totally Chocolate creative team making waves is the Tasting Box 3-Piece Gift Tower. Exactly as it is named, it brings a level of luxury to a food gift. Priced at $135.95 -$120.95, the Tasting Box is the only magnetic closed box that you can customize inside and out, to our knowledge in the world. What makes the box special is the fact that you get a little bit of everything. For example, if you were an architecture firm, on the outside of the box you can use imagery of a new home sketch in process with little notes across it showing active thoughts. When you open the box, it reveals an equally large and crisp photo of the actual finished home with a short passage describing your 15 years in business and commitment to high standards as part of your brand. This is a perfect gift that people love receiving and will simultaneously grow your brand image in the eyes of a recipient. Remember, a smart business gift pays for itself over and over. 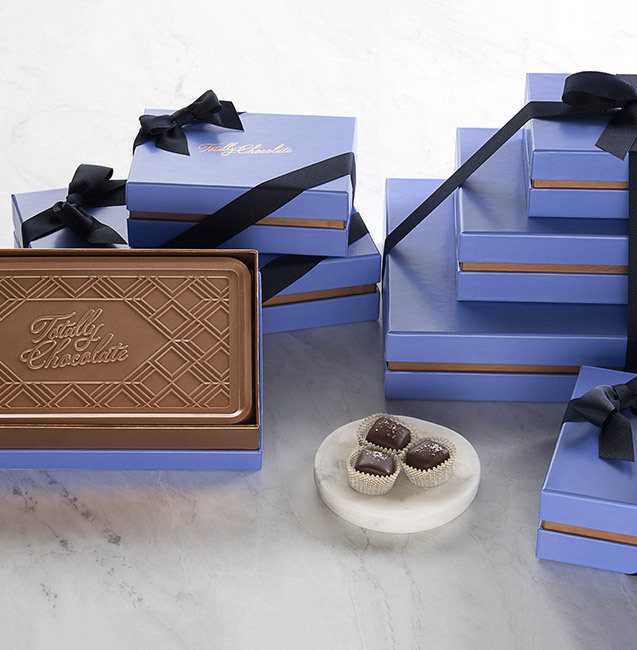 Last but not least, the 19pc Custom Chocolates Assortment has long been a staple as a moderate-sized gift that packsapunch. 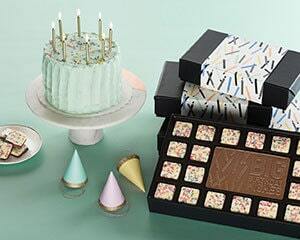 Priced at $34-22, the 19pc is a great product to be shared as it has 18 small chocolate pieces surrounding one larger center piece, adding up to its name, the 19pc. The “outer border” pieces alternate between milk and dark Belgian chocolate. You have the option of customizing them for a $150 mold charge or omitting the mold charge to use a design already completed in house that says something like Thank You in different languages or styles. Our best suggestion is to customize them in a way that is bold and prominent of your brand—something that people look at and smile because of the ingenuity, or maybe it is the tongue-in-cheek effect. For example, say you own an electrician company: make the outer pieces look like Volt-O-Meters and wire cutters. You can even go further and place the names of your staff members or other sub-brands in the surrounding squares. 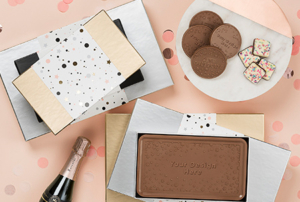 Totally Chocolate has helped thousands of companies create corporate anniversary gifts that truly reflect just how special the individual achievement really is. We revel in learning about new businesses and taking our expertise and your vision to create something we are both equally proud of. When you work with Totally Chocolate, you are not just getting a typical generic item, you are designing something entirely about you that serves your company in the best way possible. We want you to literally see a monetary return on your investment, even if it is just a gift or announcement. 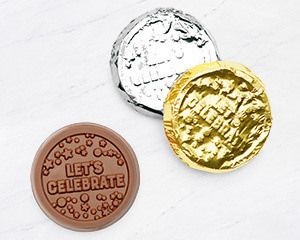 We always aim for something that elevates your company’s image, one chocolate at a time. 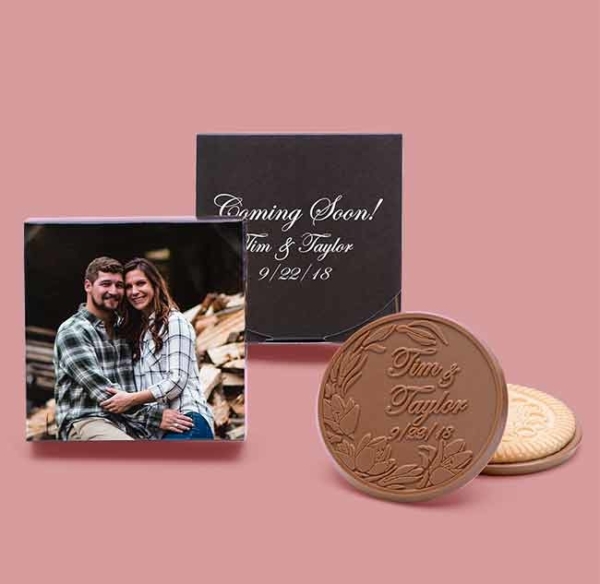 Visit our Custom Chocolate page to see it in every size and budget then design the perfect custom chocolate gift to celebrate and announce your company milestone. 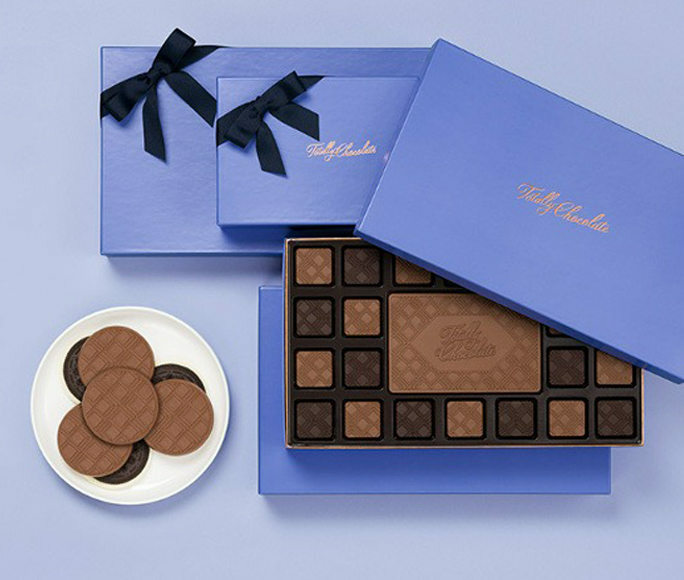 Chocolate Gifts For Delivery: Where & How Are Totally Chocolate Orders Shipped? Corporate Gifts: Do They Work? Totally Chocolate blew our minds with their over-the-top sales presentation! We now use their products to sweeten relationships with our clients! The quality of the appearance and taste is world class. Thanks Totally Chocolate for helping us reach our dreams! From beginning to end, our experience with TC was wonderful. They guided us through the process of selecting our choice, designing customer pieces and delivering it very quickly to our customers. We received a lot of positive feedback and will definitely use TC for future gift sends. 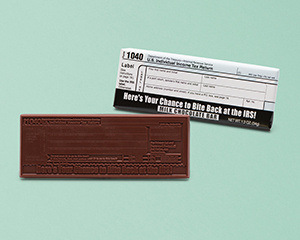 Our firm has been using Totally Chocolate for many years as a fun "gift" to hand out to our clients during tax season. We have a custom design that we use every year. Our clients know it's a tradition and love receiving them when they come in for appointments. We can always depend on them for professional service, excellent customer service, quick turnaround, and of course delicious chocolate! The most incredible cookies in the world! Our office truly goes crazy over these every year around the holidays. They are delicious and Totally Chocolate really takes care of their customers! Their box printing is also gorgeous...they printed a custom design for my company and it came out flawless. 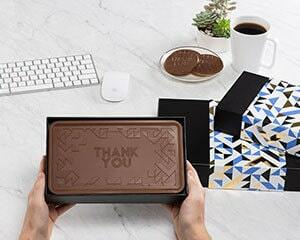 I stumbled upon Totally Chocolate this past holiday season looking for a unique gift to send to clients. Not only did they blow my expectations away but the clients all loved their gifts! The custom logo bar was such a fun way to send a sweet treat. The presentation was top notch and the chocolates tasted delightful! They are my go to for all gifts now! This is such a unique and professional way to say Thank you, Merry Christmas, Happy Birthday, Thank you for your business, the list is endless. There are so many incredible options and the quality of the product is immeasurable. Not only is it delicious and beautifully presented but it arrives in a timely manner. My rep Wendy is the best! We love Totally Chocolate! Debbie was very helpful in our quest for a unique gift for our referring offices. 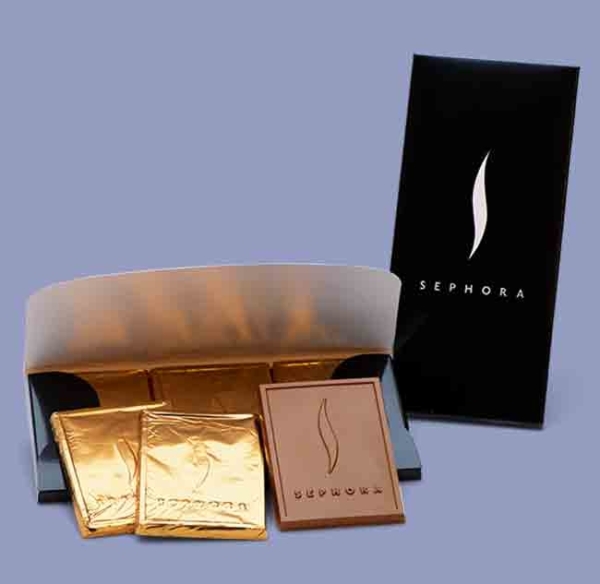 We sent out custom designed 2 pound chocolate bars with a custom designed decorative box. Totally chocolate handled everything, even the shipping. It was the easiest holiday ever for our office. Choose your product, send your mailing list and its done! We have been using Totally Chocolate for our client gifts for several years now. We have never been disappointed by the quality or customer service that this company and it's representatives provide. 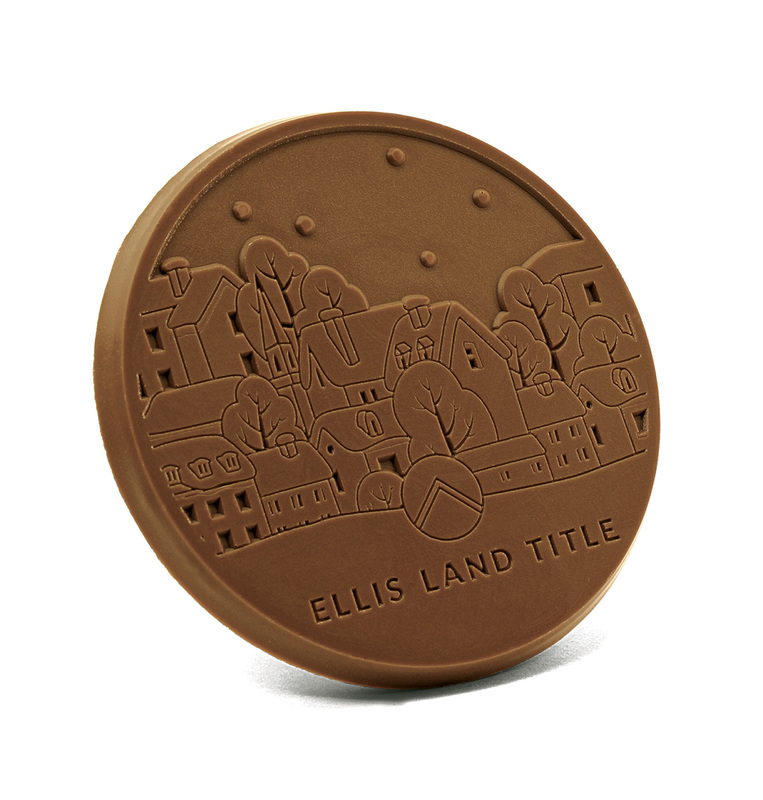 Our clients know we give these bars out each year and they can't wait to receive them! Totally Chocolate is always reinventing themselves to provide the best quality, presentation and satisfaction, which is why we continue to come back each year. We've been buying Totally Chocolate sugar cookies, dipped in chocolate, with our MINUTEMAN PRESS log imprinted on the cookie itself, for over 16 years. Hand them out mid-December, and our bigger customers start clamoring for them the minute we walk in the door! Every customer who gets one knows who they came from, whether they enjoy them immediately or a few days later. A distinctive gift that isn't forgotten! Each year we provide a "thank you" gift to our clients. For the 3rd year we used Totally Chocolate. My experience from start to finish is always terrific. Debbie was so helpful and attentive. With a 3-hour timezone difference I called one morning and expected to leave a voicemail message but Debbie was there and answered her phone! The personal attention really left me with a positive feeling about the company. When our boxes of logo-printed shortbread and chocolate cookies arrived, the customized box and the cookies exceeded my expectations. Our clients were so impressed with their delicious holiday gift. Count us in again for next year! Debbie has been wonderful! We were so pleased with the chocolates we ordered for our centennial that when we got our new logo we ordered more. Good chocolates, good customer service. Amazingly positive experience! Great products and equally great support and customer care. Every recipient raves, and rightly so: the products are wonderful & memorable. 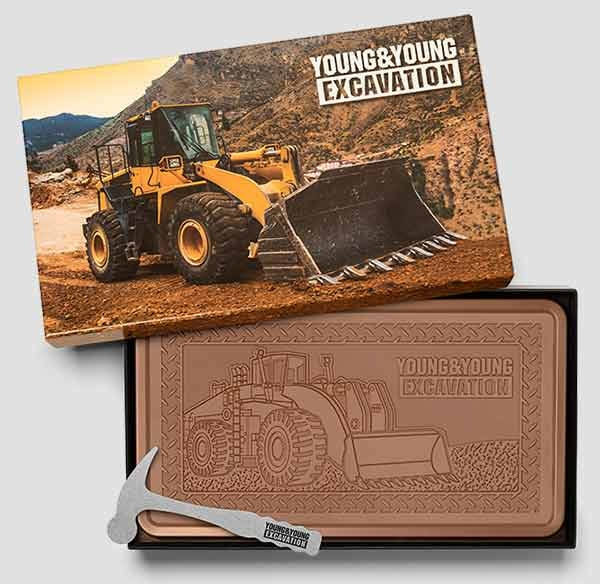 I must say that we are VERY impressed with the boxes, the cookies (so crisp), and the chocolate(yummm), and the logo imprinted (so cool to see our logo in chocolate) - and even more importantly, our clients are impressed! I don't think we can ever send regular Christmas cards out again. We've had a great experience with Totally Chocolate, start to finish. I was so glad not to have to package and ship the boxes myself. They handled everything. Polite and professional from start to finish. This will be my go-to for Client Gifts from now on. This company is awesome to work with and their products continue to impress! A wonderful company. Have ordered for the last 6-7 years and am never disappointed. A great company and a great product. 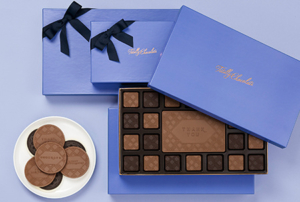 We work with TC each year to put together our annual customer chocolate gifts. TC makes it easy from the start from designing and placing the order to the delivery. The product itself is exceptional, our employees and customers always rave about the quality and taste of the chocolate and they look forward to getting it each year. Highly recommend. Great customer service!!! Delicious chocolate!! Dorene is a rockstar!!! Keep out the good work. Fantastic chocolate biscuits and 10+++ Service, Friendly customer service on phone - appears to be employee, not an outside service. Highly recommended. Unreal team and world class customer service! The new products taste amazing! Samples of our company's chocolate gifts arrived today and they look tremendous! The quality of the final art and printing is exceptional; my hat is off to Debbie Perucca and her team. From design to production, they all have my personal appreciation for the wonderful result. The team could not have been more professional and gracious to work with, and I hope we get to do it again next year. BTW, the chocolate is delicious! Wonderful selection of chocolates and designs! Wendy was extremely helpful in setting up our order and explaining the process. We not only got our order on time, but the quality was excellent. Would absolutely order again! We used Totally Chocolate for our holiday gifts this year, and were more than pleased with our decision. 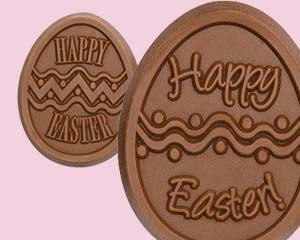 Totally Chocolates was professional and communicative throughout the order and delivery process. The product was professional and personalized, which added a special and memorable touch to our holiday gifts for clients. We would definitely use Totally Chocolates again! Excellent service and amazing chocolates! We ordered custom chocolates for customer gifts and they turned out fantastic. The team at Totally Chocolate walked us through the whole process, outlined all the costs, and created packaging that perfectly matched our branding. Will definitely be ordering next year! Totally Chocolate does amazing work for AVT Simulation every year. 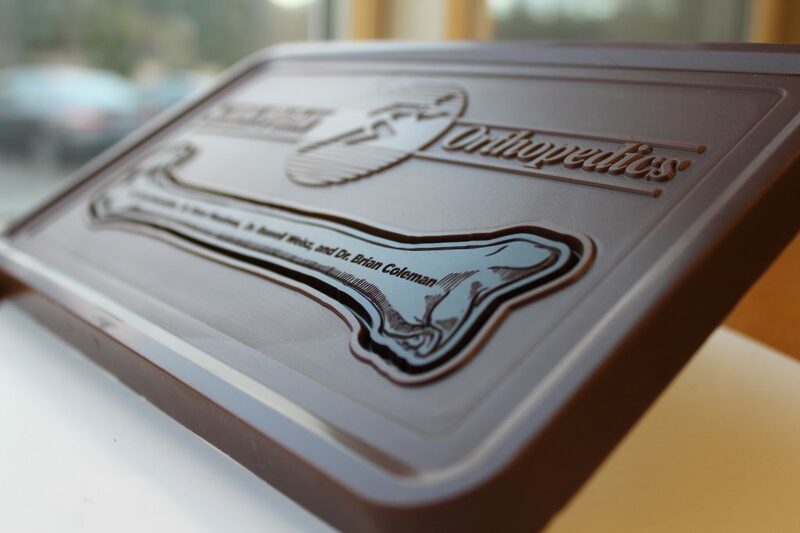 Quality imprints for our logo molds and the taste is great! They will for sure be helping us out again in the future as our customers and employees love their products. If you need a rep, make sure you ask for Wendy who has always won the day for us! Totally Chocolate is a great company to work with. I've purchased custom made 2 lb. chocolate bars for my real estate clients. 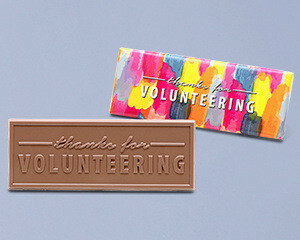 They do a fantastic job of making the chocolate bars look my business card. My clients are always so happy to get the bars. And, the chocolate is delicious! Top notch customer service throughout the process. We ordered 100 boxes of the assorted chocolates with our logo on the 4 x 6 chocolate bar in the center. We had a custom designed band on the outside of the box with our firm logo. Totally Chocolate offers high quality production, materials and excellent tasting chocolate. Dorene was the rep who helped us create the order. Her communication throughout the process was timely. Her suggestions and ideas made the purchase very smooth. I highly recommend this company if you're looking for a gift to impress your clients and business associates.